Use the Dissolve tool when you want to aggregate features based on a specified attribute or attributes. For example, you could take a feature class containing sales data collected on a county-by-county basis and use Dissolve to create a feature class containing contiguous sales regions based on the name of the salesperson in each county. Dissolve creates the sales regions by removing the boundaries between counties represented by the same salesperson. Features with the same value combinations for the specified fields will be aggregated (dissolved) into a single feature. The Dissolve Fields are written to the Output Feature Class. Dissolve may result in multipart features being created. A multipart feature is a single feature that contains noncontiguous elements and is represented in the attribute table as one record. 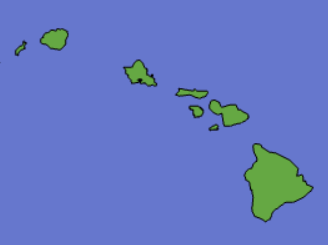 The state of Hawaii is a common example of a feature represented as a multipart feature. The state of Hawaii is often represented as a multipart feature. As part of the dissolve process, the aggregated features can also include summaries of any of the attributes present in the input features. For instance, the revenue generated in the counties making up each sales region could be summed to give the total revenue for each sales region. The Unsplit lines parameter can be used to remove endpoints that are common to only two lines and merge the two lines into one continuous line. A common endpoint shared by no more than two lines is also known as a pseudo node. The Unsplit Line tool can also be used to remove pseudo nodes.